Wave-Field’s main intention is to give people agency over the urban site the artwork inhabits. By intuitively suggesting that partnering up is essential in order to experience them, the seesaws encourage the development of interpersonal relationships between strangers and consolidate existing relationships between friends and family. Through the discovery of a language spoken by other-worldly beings – in this case, illuminated musical seesaws – the artwork becomes a mean to an end, contributing to strengthening connections between all those who choose to partner up. In addition to placing the creation of human connections as a priority, Wave-Field intends to make art accessible to all through the playful nature of the work: the tactile levels of experience offered by the seesaws result in different levels of perception of the artwork, as visual and auditory stimuli induce a novel type of physical activity. In Wave-Field, passengers are not merely witnessing the art: they act as catalyst for the activation of the artwork, and through their participation and collaboration, they become integral to the interpretation of it. When not in use, the see-saws stabilize to the horizontal and remain at a lower glowing level. When activated by users and inclined, the see-saws, wired to LED lights and a speaker, will augment in light intensification and emit a sound sequence. 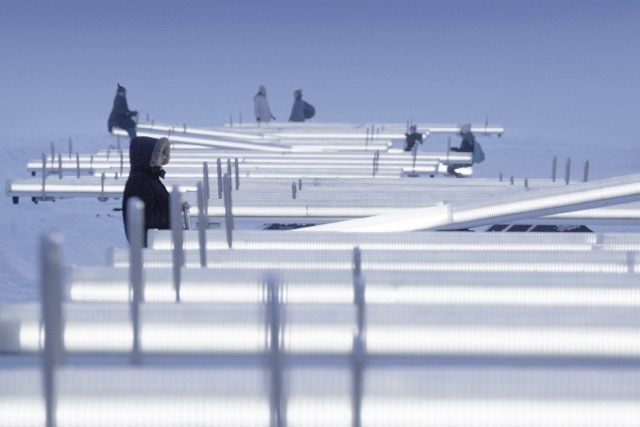 Wave-Field is an ever-changing urban instrument. Lateral Office is an architecture practice founded in 2003 by Mason White and Lola Sheppard; their work operates at the intersection of architecture, landscape, and urbanism. The studio describes its practice process as a commitment to design as a research vehicle to pose and respond to complex, urgent questions in the built environment, engaging in the wider context and climate of a project– social, ecological, or political. Lateral Office has been pursuing research and design work on the role of architecture in remote regions, particularly the Canadian North, for the past eight years. Sheppard’s work tests the potential for architecture and infrastructure to be culturally responsive, geographically scalable, environmentally adaptable, and multi-purpose in its programmability. Sheppard and White’s work has been exhibited extensively and they have lectured across the USA, Canada and Europe, including participation in the 2017 Seoul Biennale, the 2015 Chicago Biennale and the 2014 Venice Biennale. Lateral Office was awarded a 2016 RAIC Urban Design Award for Impulse, a Special Mention at the 2014 Venice Biennale for Architecture, a PA award in 2013 and the 2012 Holcim Gold for Sustainable Construction for North America, for their project Arctic Food Network. They received the Emerging Voices from the Architectural League of New York in 2011, and the 2010 Professional Prix de Rome from the Canada Council for the Arts. Lola Sheppard and Mason White are the authors of the book Many Norths: Spatial Practice in a Polar Territory (Actar 2017) and of Pamphlet Architecture 30, COUPLING: Strategies for Infrastructural Opportunism, published by Princeton Architectural Press (2011). Sheppard and White are also co-editors of the journal Bracket. Lola Sheppard is Associate Professor at the University of Waterloo; she received her B.Arch from McGill University and her M.Arch from Harvard University. She is a registered architect in Ontario and Quebec. Mason White is Associate Professor at the University of Toronto; he received his B.Arch from Virginia Tech University and his M.Arch from Harvard University. CS Design welcomes the opportunity to collaborate with architects, designers, engineers and planners. Complementing the skills of core team members, we offer various services to perfect building lighting and streamline project delivery, such as lighting and control design, fixture specification, detail integration, lighting calculations, budget estimates, installation coordination and commissioning and focus. CS Design offers expertise in many project areas such as institutional, cultural venues, retail, residential, heritage and urban spaces. Conor Sampson, the founding associate, is a lighting designer and a registered architect. He teaches lighting design at McGill University and is the Canadian Liaison to ISO (International Standards Organization) Technical Committee 274 (Lighting). Mr. Sampson holds a Masters in Lighting Design from the Parsons School of Design and a Bachelor of Architecture from McGill University. He has practiced in New York, Washington, DC, and Montreal. Together, Lateral Office and CS Design have created many award-winning interactive installations that have traveled across Europe and North America.